Where do YOU Jianghu? We'd like to know! 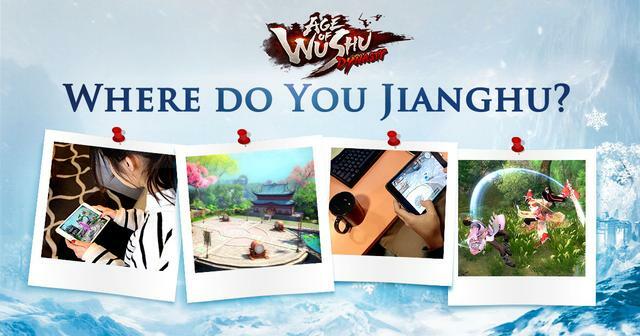 Share your entry to the new "Where Do YOU Jianghu?" picture submission event on this thread. Step 3 - don't forget your info! We need your IGN and server, as well as a short description of where your favorite place to play Age of Wushu Dynasty is and why! Where do I Jinghu you ask? My work is a little different than most peoples though. I spend my day tending to the wonderful elixirs that I have made for the good peoples of the world. As the fermentation process more or less takes care of itself, it leaves me with a fair amount of free time to wander through the Ming Dynasty in search of worthy challengers.
. I prefer to jianghu in my living room, because it the place to relax while watching my favorite tv stations. My IGN is PEDANGNAGA server SEA S2-SPEAR. Jianghu everywhere when I have free time hahaha..., But my bed is a special place for Jainghu. Play it on the sofa are my best love to age of wushu dynasty experience. I strike from the shadows, beware the darkness in your soul. I like to play on bed at night which is comfortable for me. I usually play Age of Wushu Dynasty in my bedroom. Creat team, go jianghu adventure, trial with friend is my favourite thing in day. We also fight boss everyday at boss time. Hope game will be No1 game in the world . Evrywhere i have wifi i will join Age of Wushu Dynasty.